So, I picked up this book based on narfna’s review. I was surprised when I went to the library to pick it up how long it was. I was thinking more of a picture book length, for some reason, but I was pleasantly surprised with how much of this there was to enjoy! The first thing I noticed was that there are pattern pieces on all of the chapter titles. I don’t actually know how to sew garments, but I’m wondering if there is a complete set of patterns, and if so what they would make. The story takes place in Paris, “at the dawn of the modern age.” We have the beginning of a Cinderella tale, with a ball inviting all of the young ladies to try to come and snag the prince. 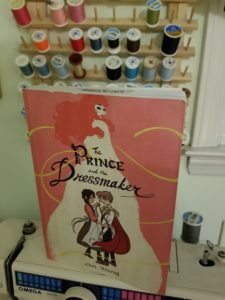 One young lady needs a new dress last minute, and Frances is chosen to make it for her. The young lady is apathetic, and when asked about her fashion preferences, responds: “Whatever. You know what, make it ghastly. Make me look like the devil’s wench.” (Which, btw, is the best line ever!) And so Frances does. Unlike the frilly pastels that are expected, this dress is black and has a mesh skirt. The next morning when her boss is in the middle of firing her, a mysterious man comes and offers her employment as a seamstress. Frances agrees, only knowing the pay and that she leaves in the morning. We quickly discover that her new employer is Prince Sebastian (come on, it’s in the title.) He tries to hide his identity, but that only works for a very short time. (Come on, how long did he really think he would be able to pull that off?) Sebastian likes to wear dresses, and Frances does not judge him for it. He is also fashion forward, and so begins their friendship. Their troubles begin when they start going out, with Sebastian taking on the identity of Lady Crystallia, one of the most fashionable ladies in Paris. That sort of thing gains attention. They meet a young man, Peter, who is helping to create the first department store in Paris, and wants Frances to design for him. While Lady Crystallia is enjoying the spotlight, Frances is being kept out of it in order to keep Sebastian’s two identities separate. Frances decides that she’s done, realizing that while she is in Lady Crystallia’s shadow, she can never be in the light herself. We see hints of romance between Frances and Peter as well as Frances and Sebastian. (I’m more for Frances and Peter, because Peter doesn’t treat her like crap.) I feel like Sebastian is not truly attracted to Frances, but still loves her. She sees him for what he is, and he can be his true self around her, and that sort of thing can be heady. As Prince, Sebastian is forced into courting young ladies. I kind of feel bad for the girl he chooses. She didn’t know what she was signing up for, and she was never nasty. Of course, everything goes to pieces, but we have a cute resolution. I like how there isn’t strictly an “and everyone lived happily ever after” ending, because that’s not realistic. Life is messy, especially when political figures are involved. What are the odds that any prince, let alone a cross-dressing one, could live “happily ever after?” They could be happy, yes, but not all the time, and not in all aspects of their lives. Share the post "A wonderful twist that makes a better story"
I’m glad you liked this! I didn’t even notice that about the chapter titles, and now am pretty curious.